For about thirty nail biting minutes, players' nerves are tested to the limit by the threat of the ticking Bomb. A card is drawn bearing two or more letters. The variable length fuse (10 secs to 1 min) is set and the ticking Bomb is passed to the first player. 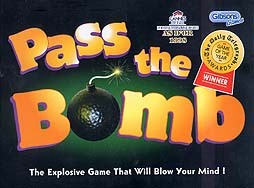 In turn players must shout out a word that contains the letters on the card and pass on the Bomb before it goes off! Words must be in common use and can only be used once in each round. Players may challenge at their discretion. All too often the word you think of as you await your turn is used by a preceding player and even those who boast the largest vocabularies suddenly find their minds go completely blank as the infernal Bomb ticks away. Any number of players, but be warned - not for the shy and retiring! Not a bad little game, the game description above sums it up pretty well. Think of a word before the bomb goes off, its amazing how your mind can go blank just as you get the bomb. We use this as a party game when we have too many people or not enough time for anything more serious. Every time we have played this its has gone over really well. Its quick to play and anyone can join in the fun whatever age they may be. If you are feeling creative you could make up categories of other things for people to name, for example species of birds or football teams etc.